PocketBook presents the new follower of the legendary bestseller PocketBook Touch Lux - PocketBook Touch Lux 2. The new model will open a new level of freedom for the devoted admirers of electronic reading. The freedom of reading is, primarily, the ability to read under all conditions regardless of lighting due to the integrated LED frontlight and the unique properties of the E Ink screen. 6 inch E Ink Pearl HD screen displays texts more vividly and clearly. Powerful 1 GHz processor and 256 MB of RAM will provide smooth and fast response of any application. Due to multi-touch display and intuitive interface using the new reader is incredibly comfortable. In comparison with its predecessors PocketBook Touch Lux 2 has got a slimmer body - the new reader fits your palm even better while soft-touch coating of the rear panel facilitates holding it with one hand. 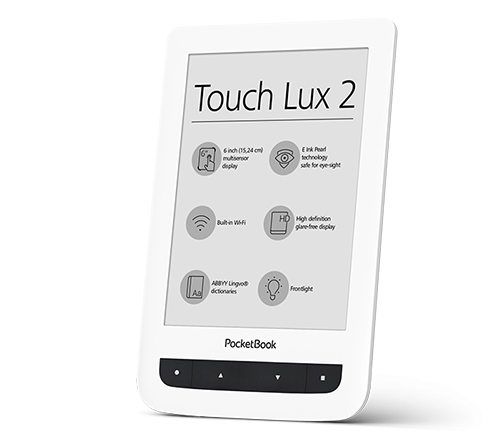 Reading with PocketBook Touch Lux 2 is a new level of freedom and comfort from a recognized Touch flagship! Increased battery volume allows you to read weeks long without recharging and 4 GB of internal memory, expandable up to 32 GB – a big library that is always at hand. 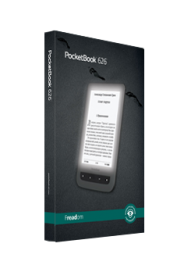 PocketBook Touch Lux 2 reads 16 book formats without converting (EPUB DRM, EPUB, PDF DRM, PDF, FB2, FB2.ZIP, TXT, DJVU, HTM, HTML, DOC, DOCX, RTF, CHM, TCR), and allows you to view 4 graphic (JPEG, BMP, PNG, TIFF).